I haven’t actually played Super Mario Galaxy, and when I saw Tavie play a little bit of it, it looked complicated. I guess it’s just that I’m old-fashioned, and used to seeing Mario in only two dimensions. Nevertheless, I can’t help but like the character of Rosalina, who is basically a goddess. Not all-powerful by any means, but with powers and responsibilities of cosmic proportions. Considering how prominent the Goddesses have become in Shigeru Miyamoto’s other game series, Zelda, it’s always seemed a little weird that we don’t see much of the mysticism behind the Mushroom World. I guess it’s largely because the Mario series has always been lighter and more childlike than many other franchises, so they aren’t going to delve much into the metaphysical. Rosalina basically raises baby stars, known as Lumas, until they’re ready to grow into celestial objects, making her sort of a mother goddess. The thing is, she appears to have started life as a fairly ordinary human, as detailed in an autobiographical storybook that she reads to the star children. After her mother died, she took up with a Luma who had also lost its mother, and she eventually created her flying Comet Observatory as a home for the young stars. Every century, she pays a visit to her home world, which is celebrated with a festival in the Mushroom Kingdom. Pretty melancholy stuff for a Mario game, huh? The book also mentions a father and brother, but there’s nothing about what happened to them. 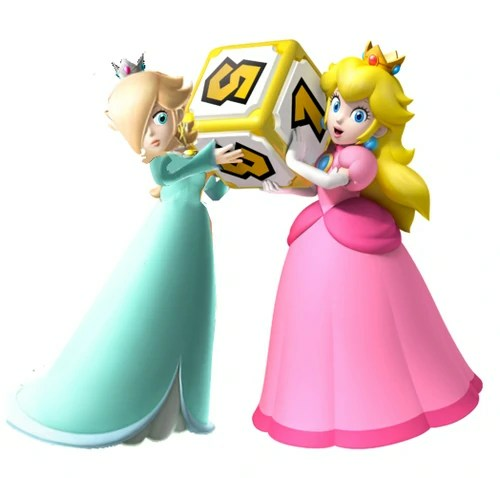 Apparently Rosalina was originally intended to be related to Princess Peach, but this is purposely left ambiguous in the final game. Certainly, the picture of her mom looks like the Princess, and the book also shows a castle and hill that look like the ones from the beginning of the game. GameTheories proposes that Peach herself is Rosalina’s mother, and that the reason she’s still alive is involved time travel or recreation. It’s also a common theory that the two of them are sisters, which would also mean Peach has a brother we haven’t met yet. Apparently the French version of the storybook mentions that Rosalina’s father has a mustache, which could mean it’s Mario or Luigi, but Peach’s father as he appears in the Nintendo Comics System also has a mustache. Besides, Rosalina and her mother might look like Peach simply because that’s the style in which humans are rendered in that series. And if the Koopalings are sometimes Bowser’s kids and sometimes not, how can we expect any relationships in these games to be consistent? Next they’ll probably be telling us that Mario and Luigi aren’t biological brothers. Rosalina has proven to be rather popular, appearing not only in the Galaxy games and sports titles, but also in the upcoming Super Smash Bros. games and as a hidden playable character in Super Mario 3D World. This means that she’s beaten out Daisy and Waluigi as far as being playable in one of the main Mario games goes. In Mario Kart, she’s one of the heavier characters, in the same class as Donkey Kong. She looks quite thin, so I don’t think that weight is fat or muscle. It’s more that she’s just a larger-than-life person in all respects, more like a storybook giant than an actual human with giant features. Maybe her large size and long life can be attributed to eating Star Bits, normally food for Lumas. 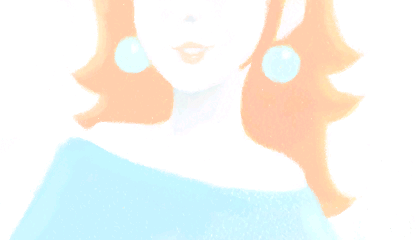 Her Veronica Lake hairstyle wasn’t present in the earliest concept art, and was probably added to differentiate her more from Peach and Daisy. As mentioned on Back of the Cereal Box several years ago, Rosalina’s original Japanese name was Rosetta, which is a kind of orbit. Why the English translators changed it, I can’t say. “Rosalina” is likely a variant on the Italian name Rosalinda, meaning “beautiful rose.” I guess this fits in with the floral names of the other princesses, since a peach is a flower as well as a fruit. But then, peach blossoms are pink and daisies yellow, and there aren’t any turquoise roses (as far as I know). And I suppose her sad eyes are not intended as a reference to the Billy Joel song “Rosalinda’s Eyes.” I can’t help drawing a connection between Rosalina and a very minor character from Grampa in Oz, the sky shepherdess Maribella. Described as a “cunning little lady” with a moon bonnet and skirts embroidered with stars, she says that her job is to keep the baby stars from falling out of the Milky Way. Prince Tatters uses her knitting bag to carry his father’s head. The fact that Maribella has somewhat of a compound name is a nice bonus. This entry was posted in Characters, Mario, Oz, Oz Authors, Ruth Plumly Thompson, Video Games, Zelda and tagged grampa in oz, king fumbo, lumas, maribella, mario kart, mushroom king, mushroom kingdom, nintendo comics system, prince tatters, princess daisy, princess peach toadstool, shigeru miyamoto, stars, super mario 3d world, super mario galaxy, super smash bros., waluigi. Bookmark the permalink.